Greetings to you, dear representative of Jesus Christ on Earth, the light of God, the harbinger of peace and justice.Greetings to all Christians during this blessed time of year. May God bring peace, guidance and justice to all in the New Year. As an outspoken religious leader who has long publicly opposed the mingling of religion with politics, I have been jailed in Iran by a false religious regime and its corrupt religious leaders for many years. During that time, I have been grievously tortured, physically and psychologically, while my family members have also repeatedly suffered abuse. Because of my long time opposition to Iran’s Islamic dictatorship, I continue to struggle with my captors to promote the reality and sanctity of religion, even while they continue to defile and attempt to demolish divine principles and beliefs. But now I am becoming increasingly weak, physically injured and sick due to prison conditions of sustained malnutrition, as well as no medical treatment or medicine. Starting 33 years ago, when materialistic and selfish clerics took control of Iran and imposed a perverse version of religion on the country, the Iranian people began to turn away from God and true religious values. Few here nowadays are interested in the world hereafter. However, I have not wavered in my zeal to serve God and have continued to serve him by trying to lead the Iranian people back to him. Now, at this blessed Christmas time, I humbly ask you to commit whatever help, support and resources you can. I remain committed to my ancestral religion of Islam, but I also support monotheist beliefs in all other sects and religions. My goal is to promote in this country’s and the world’s public conscience a belief in and commitment to our mutual God. Many of the Iranian people who had been religious and consistent followers of God throughout past governments are now abandoning their beliefs in the divine. As a reaction to the false and brutal religion imposed by the regime, the people are increasingly losing their faith and turning to non-belief and materialism. Those like me who truly devote themselves to God are being shunned and censored by the media. By effectively silencing the voices of the truly faithful, the counterfeit and corrupt rulers here seek to demolish truly divine beliefs and to dishonor the Holy Spirit. 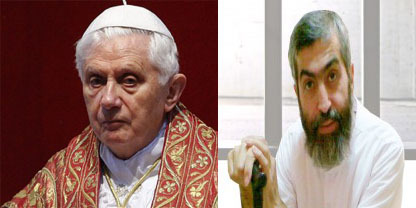 Your Eminence, seven years ago I sent a letter via some concerned Priests in Tehran to His Holiness the Pope, asking for his assistance. Unfortunately, I never received any response. Consequently, the government’s Mullahs accused me of heresy and sentenced me to indefinite imprisonment and other cruel punishments. Now I ask you, as a great religious leader, to support me in all possible ways for the preservation of our mutual monotheism and the honoring of our Lord and Creator. I also request that you publicly decree an urgent commitment to save monotheism in Iran and to support me and others here struggling to do the same. The time period for effective action is quickly passing and opportunities to turn things around are being lost every day. Once they are gone, those opportunities will be forever lost.